Duthiea brachypodia (P. Candargy) Keng et Keng f.植物分类学报10 (2) : 182. 1965;中国高等植物图鉴5:96. 图7022. 1976. 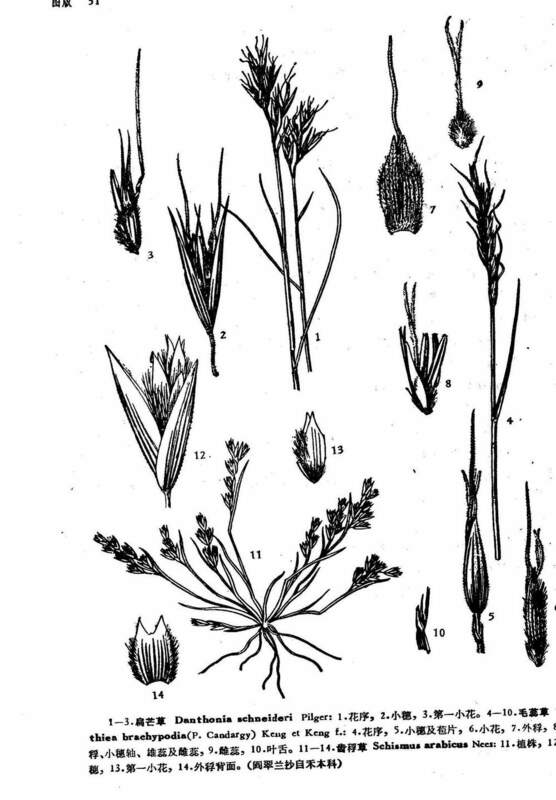 ——Triavenopsis brachypodium P. Candargy, Trib. Hodees, Mus. Hist. Nat. Paris 65. 1897-99. ——Thrixgyne dura Keng in Sunyatsenia 6(2): 82. Pl. 13. 1941. ——Duthiea nepalensis Bor in Kew Bull. 1953: 550. 1954, et Grass. Burma Ceyl. Ind. Pakist. 436. f. 46B. 1960. ——Duthiea dura (Keng) Keng et Keng f.南京大学学报 (自然科学版) 2: 92. 1956;禾本科图说500.图429. 1959.